A veteran police detective took home more than $403,000 in earnings last year, topping the list of Boston’s highest-paid employees in 2016, newly released city payroll data show. Detective Waiman Lee had earnings that included $58,600 in overtime, more than $121,900 for police detail work, and a one-time retroactive check for $92,500 that he received last year after an arbitrator ordered the city to give detectives a hefty pay raise over a six-year period. His regular pay was about $92,500. By contrast, his boss, Police Commissioner William B. Evans, was paid $245,300, the records show. Mayor Martin J. Walsh took home $175,000. 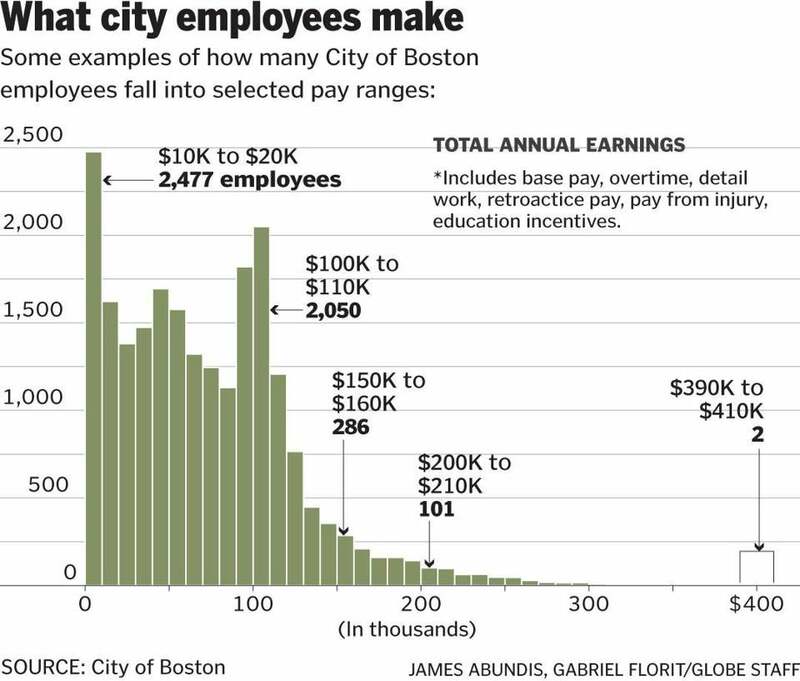 In fact, the data show, nearly all of the city government’s top 100 wage earners were all members of the Boston Police Department, with 22 members, most of them detectives, taking home more than $300,000 last year. The data also show that Superintendent Tommy Chang, with total earnings of $271,700 last year, was the highest-paid official not involved in public safety. Norman Parks, assistant superintendent of highway maintenance in the Public Works Department, topped the list among non-education and non-public safety employees. He earned $194,000, including more than $84,800 in overtime, in 2016, the records show. Overall, Boston’s payroll increased by roughly $73 million from 2015, up about 5 percent to $1.6 billion, said David Sweeney, the city’s chief financial officer. Total overtime costs dipped below $100 million — a 2 percent decline from 2015. Officials credit that to management initiatives aimed at reducing overtime hours. “The City of Boston has carefully managed our personnel numbers and overtime, consistent with our overall record of responsible fiscal management that secured the highest bond ratings in the city’s history,’’ Sweeney said in a statement. The retroactive pay for police detectives and command staff — about $21 million, officials said — covered six years. The detectives got the boost last year after an independent arbitrator ordered the city to give them a nearly 29 percent pay increase to cover a six-year period that spanned July 1, 2010, to June 30, 2016. The city paid up, cutting one-time checks for the detectives. That meant that, in addition to their base salaries, earnings for overtime, and detail work pay, the detectives got tens of thousands of dollars added to their bottom lines. Detective Windell C. Josey, the city’s second-highest earner last year, was paid $396,300. That included regular pay of about $92,500 plus $89,600 in overtime and a retroactive payment of $100,300. The third-highest earner, Detective Paul A. Painten, was paid $374,000, which included regular pay plus $82,500 in overtime and $115,700 in retroactive pay. He was followed by Detective Gregory Brown, who got $87,500 in overtime and $134,500 in retroactive pay, along with regular earnings. In all, more than 500 detectives earned between $200,000 and $300,000, records show. The city saw an increase of about $3 million in police detail earnings in 2016 over 2015, officials said. But they stressed that details are paid by private companies and not the city. The records released Monday included more than 17,000 full-time employees at the start of the year. There were roughly 16,900 employees on the city’s payroll at the same time in 2016.
can be reached at meghan.irons@globe.com.